Gansett And Barstool Sports Best Can Finals! The greatest contest ever is sadly coming to an end. But we’re going out with a bang. Gansett and Barstool Sports will be hosting the biggest party to end the Summer right. 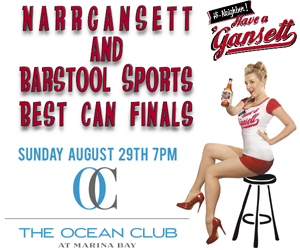 The Best Can Finals are this Sunday, August 29 at The Ocean Club in Quincy, MA. It all starts at 7pm. DJ BretTheHitMan will be there bumping today’s hottest beats to keep the swagger fresh. If you miss this, then you’ll never know who has the best can in New England!